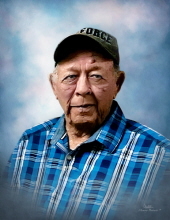 Funeral services for Thomas Carroll (Buck) Goins will be held at 2:30 p.m. on Tuesday, March 19, 2019, at Cold Springs Baptist Church with Reverends Ricky Robertson, Myron Erwin, and family friend, Jim Wise officiating. Burial will follow in Cold Springs Cemetery under the direction of Jeane’s Funeral Service. Visitation for the family and friends of Mr. Goins will begin at 3:00 p.m. on Monday, March 18th at the church and will continue until the time of service on Tuesday. Thomas Carroll (Buck) Goins was born on May 5, 1934 to Barney and Daisy Goins. He passed away on March 16, 2019, in Anacoco, LA at the age of 84. He never met a stranger and loved to laugh, joke, and talk. If you talked to him long enough, you were going to be kin to him. He loved hunting and family history. Also, he sang in a quartet at the Louisiana Hayride. He had many kids he would consider grandkids. He was known to many as Buck, PawPaw, Daddy, and Uncle Buck. He will be greatly missed by all who knew and loved him. Mr. Goins was preceded in death by his wife, Linda Faye Garess Goins, granddaughter, Autumn Ray Goins, father, Barney Goins, mother, Daisy Goins, brother, Grover Goins, and sisters, Laura Zelma Dean Martin and Ethel Lou Smith. Pallbearers will be Dwayne Bridges, Mike Josey, Harlen Hagan, Dillon Hillmon, Heath Williams, Lane Belsha and John Perkins. To send flowers or a remembrance gift to the family of Thomas Carroll (Buck) Goins, please visit our Tribute Store. "Email Address" would like to share the life celebration of Thomas Carroll (Buck) Goins. Click on the "link" to go to share a favorite memory or leave a condolence message for the family.